I woke in the night to the sound of the downpour, yet when I rose at six the rain had ceased and the air was cool and fresh, with the call of the wood-pigeon echoing in the still of the morning. By the time I reached the market at seven, there was already a brisk trade and the traders were cheerful at the opportune timing of the rain, good for gardeners and good for the market too. The damp air brought out all the fragrances of the flowers and, as one trader wheeled a barrow of bunches of sweet peas past me this morning, the scent was intense. I was in no mood for any arduous gardening today, in this humid weather, so I simply bought myself two pots of these delicious Pinks, the attractively named Whatfield Ruby for £3 each – the colour of strawberry blamanche – to stand in pots on a wall. Each summer, I collect more Pinks. 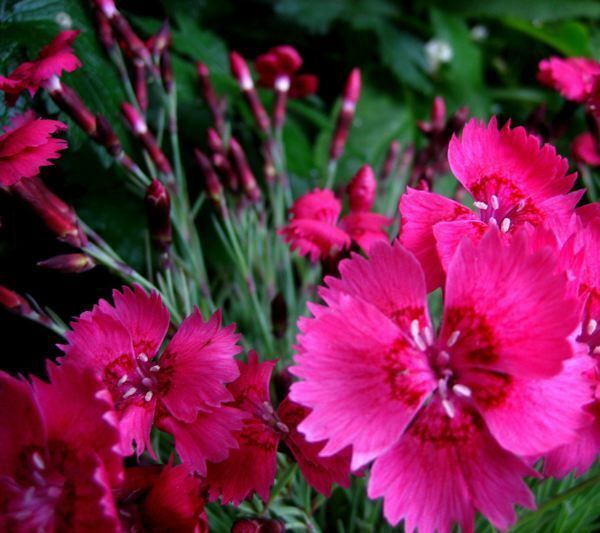 The single less-cultivated varieties are my preference in pale or deep pink, as these are. It is the subtle details that speak to me, the deep red pattern of veins and the lovely denticulated ends of the petals. I leaned perilously far out of the window to photograph this Passion Flower (Passiflora Cerulaea) for you, that has just reached the first floor and came into flower this week. It cost me just £6 for a tiny plant at Columbia Rd last year and now it covers a vast wall. As I contemplated the consequence of falling – while eyeballing this gloriously strange bloom – the gruesome religious iconography of the flower came to mind. Apparently, the three stamens represent the nails of the crucifixion, the lower five stand for the five wounds, while the attractive blue rosette of filaments recalls the crown of thorns and the ten petals remind us of the ten true apostles. 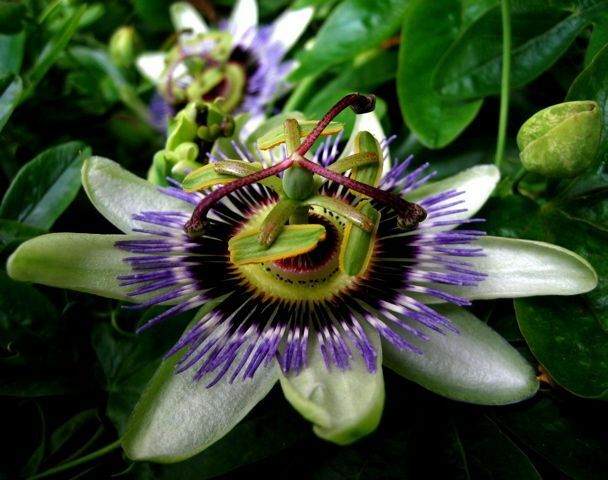 It was a suitably sober lesson for a Sunday, but my affection for the Passion Flower is purely aesthetic. Like so many brooches adorning the wall, the decorative extravagance of these prolific flowers is an irresistible delight to me.